I’ve been home for nearly a week, still on the nasty antibiotics, still putting one foot in front of the other. Slowly – and usually lurching from one perch to another. Standing up doesn’t last for long, and walking barely gets me 100m before I conk out. I am trying to do more and more each day, but it really is baby steps. Mark is being amazing. I am so glad I married that man. I can’t imagine going through this horror with a lesser man by my side. None of this is easy, but having a partner that loves, respects, and supports me in such a tangible way makes the burden a little easier. Every little thing I can’t do, someone else is picking up the slack. Between Mark, and his parents, and my parents, everything is being done. And yesterday, with a lot of help from family and very dear friends, Inigo had a brilliant birthday party. And I did nothing, except sit on my couch and try not to cry while we sang happy birthday. So life is ticking along, this week I have to write some words to say at the service, choose some flowers, and sort out a few details, and I will get there. One foot in front of the other. Any day I can get out of bed and spend at least one hour of the day without crying is a good day. Oh, and I thought I’d better mention – on Friday, please feel free to bring kids to the funeral. We’ve spoken to a grief counsellor from Sids & Kids who recommends that it is best for Inigo that he attend the funeral. We will be giving the children stickers so that they can decorate the coffin, so that the kids can feel part of the service. Also, it’s perfectly appropriate to wear bright colours if you would like to. And if you feel more comfortable in traditional black, that is ok too. I just skimmed the wikipedia article about sepsis. It has a 20% mortality rate, and according to my friend Maree (a nurse with a masters degree), it feeds on muscle mass. No wonder I feel so crap! Forecast is for afternoon thunderstorms, so I am assuming that the morning will be fine. 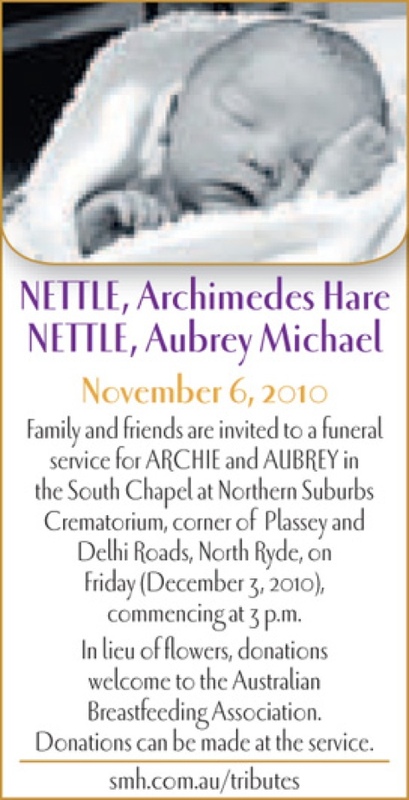 Friends and family are invited to join us in celebrating the short life of Archimedes Hare Nettle, and his little brother Aubrey Michael Nettle, on Friday, December 3rd at 3pm in the South Chapel at Northern Suburbs Crematorium. Please join us afterwards for refreshments at Bev & Teds. I know I will need a lot of refreshing. If you would like to help out with catering, please call Maree on 0403 487 785. In lieu of flowers, please make a donation to the Australian Breastfeeding Association in their names. Today has been my first day at home alone, and its been a stinker. But I have managed to catch up with a friend, get to the pharmacy to fill a script, arrange a funeral and a birthday party, and place a funeral notice (in tomorrows SMH). 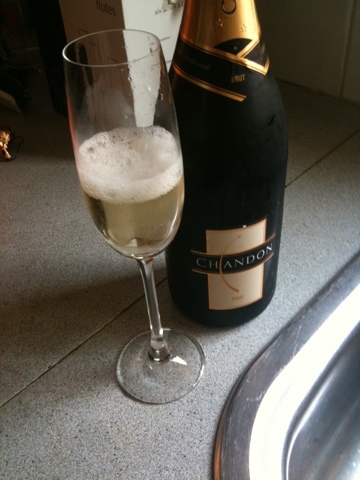 Now, I think I might get drunk. Inigo turns three on Monday, so were having a little party to try to inject some happiness into our sad world. Please let me know if you’d like to come – I havent been able to issue invitations like a civilised person, but it would be a good thing to have an idea of of numbers. Bring: Some snackage will be provided, but please feel free to bring a plate or something to drink. Also picnic chairs and sun shelter if you need them. Call Lara for alternate arrangements in case of bad weather. Just saw Roshini, I am going to be discharged today! Mark had just arrived at work, so he is on his way back to help me make the big move home. Apparently I will need 10 days on oral antibiotics, and I have to come back for a 6 week post natal check, and then I can stay away from the hospital until late Jan, when I have to have another test. but more of that later, I am off to shower and pack! Tonight, I get to sleep in my own bed, with my two beautiful guys. Author laranettlePosted on November 23, 2010 Categories Spawn, The Life of Lara13 Comments on Getting out!